Dr Fox provides the lowest cost Propecia tablets on prescription available anywhere in the UK (compare Propecia prices with other UK online clinics). This is a fully regulated UK clinic employing GMC registered UK doctors. The tablets are posted from a UK regulated pharmacy. Men can go to the Dr Fox hair loss page and follow the links all the way through to arrange for tablets to be posted out at one online visit. Where other online clinics charge up to 3 times the wholesale price for Propecia Dr Fox charges only a few pounds over the wholesale price. Dr Fox prices include the price of the consultation. Propecia tablets are made by the drug company Merck, also known as MSD. This is the only drug company making genuine Propecia. Propecia is a brand name, the medical name of the active ingredient is ‘finasteride’ in a 1mg strength. 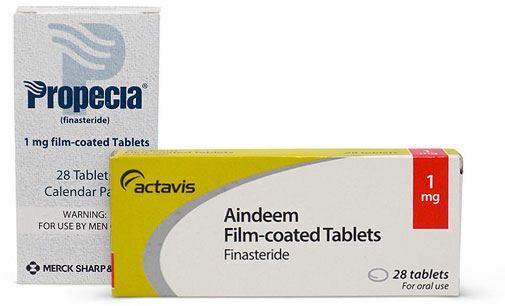 Since October 2014 lower cost generic Propecia marketed as finasteride 1mg has been licensed for sale in the UK, and is medically the same as branded Propecia. Both are available from Dr Fox. Propecia is a safe drug with few significant side effects. Most men take it without having side effects. In studies 2% of men stopped taking Propecia because of side effects, less than those taking a placebo (dummy tablets). In clinical studies, a small number (less than 4 in 100) of men taking Propecia experienced a loss of libido, erectile dysfunction, or reduced sperm volume. These usually improve after the first 12 months of taking Propecia. Less than 1% of men stopped the treatment because of these side effects. Fertility is not effected. For a full list of side effects see Propecia patient information leaflet. Propecia (Finasteride) tablets are only effective for male pattern hair loss. They should not be taken by women and may cause harm in pregnancy. Men with typical male pattern hair loss have an increases sensitivity to a natural hormone called DHT (Dihydrotestosterone). Propecia (Finasteride 1 mg) blocks the production of DHT and reduces its levels. The effect is to reduce a key driver to typical male hair loss. The mechanism of hair loss in women is different and therefore Propecia does not work in women. 9 out of 10 have more or the same amount of hair at the end of 12 months of daily Propecia, compared to 4 out of 10 taking a dummy tablets. Improvement is sustained in most case over 5 years. Propecia needs to be taken daily continuously for maximum benefit. Some men take it at the same time as using a scalp application called Regaine. Regaine works by stimulating the circulation in the scalp and has an additive effect. Regaine and Propecia (Finasteride 1 mg) are not suitable where there is scalp inflammation, hair loss in irregular patches or rapid hair loss. They work to reverse the gradual thinning of hair in fit healthy people. For more information on hair loss see NHS – hair loss information page. For the cheapest Propecia in the UK from Merck including prescription and recorded delivery order online from Dr Fox. Posted on August 2, 2010 March 27, 2019 by Dr Tony Steele in Health News, Online clinic, Propecia/finasteride.